We like to think that we're open to admitting our mistakes.For example, we didn't think we could beat the brilliance of our usual high-quality tungsten, but we proved ourselves wrong with this ring.This white tungsten piece is like a gleaming pearl in a dark ocean, a glittering star in the night sky, a shining lighthouse on a dark horizon.But really, the white tungsten gives this ring the luxury appearance of top-grade platinum, with the added appeal of being scratch-resistant, sturdy, and hypoallergenic.At 8mm thick, this ring is well proportioned for any hand. Comfort fit tungsten rings usually run 1/2 size larger, it is suggested you buy a half size smaller than your standard ring size. We recommend having your finger measured for a comfort fit ring at your local jewelry store for an accurate fit. All of our tungsten rings come with a lifetime warranty. 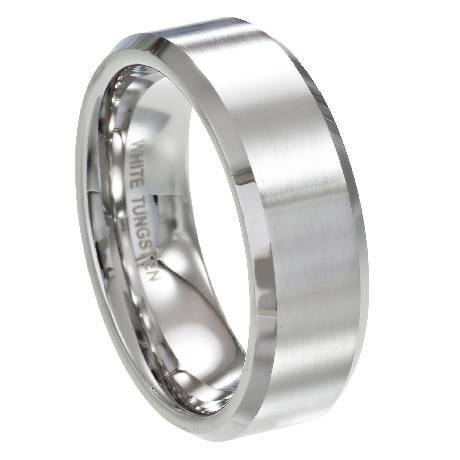 This is the second tungsten ring I bought for my husband from this site. It was just as nice as the first. The color looks like white gold, the band is super nice and sturdy, and it fits true to size! Looks great on my hubby. I just ordered a third ring tonight, I love them so much and this site is amazing!!! !